There is a great demand for new innovative therapies both in Germany and worldwide. Clinical trials are obligatory to achieve this goal. On the one hand, there is an ongoing process of monitoring and research on pre-existing medicine and therapies improving the safety for patients by gaining profound knowledge and findings which are relevant for future use. On the other hand, clinical studies are used for scientific research and the development of new treatments as well as medicine. The aim is the optimal outcome for patients concerning the safety, the reduction of side effects and an improvement of the medical therapy or drug tolerance. What characterizes a good and reliable clinical trial? Clinical trials have to follow strict guidelines consisting of internationally accepted scientific and ethical rules which constantly adapt according to current information. These guidelines, who aim to guarantee the safety of each participant, are summarized in the term GCP, meaning good clinical practice. What are the different phases of a Clinical Trial in humans? Clinical trials can be divided into 4 stages called “phases“. The earliest phase focuses on whether the medicine is effective and what kind of unexpected side effects occur. Later phases compare the new treatment being established to an pre-existing treatment. Going through the phases 1 to 3 the group of patients enlarges in order to proof how the new therapy works for a large population. Whereas about 10-15 participants take part in phase-0, there are already up to 10,000 participants involved in phase-3. These large cohorts of participants contribute to the high expense of clinical trials and only one out of 300,000 new drug compounds will be established as a new therapy. Phase-0-trials are not obligatory and precede the actual clinical trial. A low dosage of the medicine is given to a healthy test person in order to find out if the medicine/drug fulfills expected effects. Phase-1-trials stresses the bodies coping strategies with the given medicine. Hereby it emphasizes the drug tolerance, possible side effects and maximum tolerated dose. This dosage is usually the one being approved within the trial based on the expected effect. Phase-2-trials aims to establish the optimal dosage. Furthermore it analyses the effect of the drug/medicine within controlled experiments. The goal of this phase is to estimate whether the medicine is effective and efficient enough so that phase 3 can be continued with a larger group of participants. Phase-3-trials try to offer evidence for the therapeutic effect. Large numbers of participants are involved in order to provide an appropriate and reliable comparison to pre-existing treatments for a large population. This phase is supervised by government and has to fulfill certain requirements as for example a positive risk-benefit balance. After passing all regulatory aspects the responsible authority will give permission to the pharmaceutical company to produce and sell the new medicine. Phase-4-trials focuses on gaining a more sufficient knowledge about long term and rare side effects after the medicine has been proven effective and a license has already been granted. Do participants have any advantages? 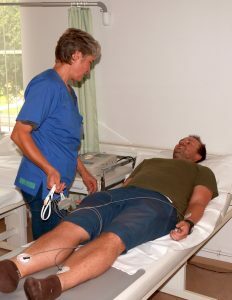 Participants are being closely monitored and receive extra care and support by a professionally trained medical team. This profound treatment is usually not covered by health insurances. Moreover, participants get access to new and promising treatments. Their participation contributes to the medical research, that might has a positive effect for them and the whole society. Participants will receive a representation allowance for example the refund of travel expenses. However, it is important to say that the financial benefit should not be the reason for participating in clinical trials. How does a clinical trial proceed? In order to take part in a clinical trial, participants have to fulfill specific inclusion and exclusion criteria which are checked by a medical examination. They have to go through a detailed and explanatory meeting explaining the process, conditions and potential risks. The participant and the investigator sign a consensus form in order to document all relevant aspects for the clinical trial. Afterwards the participant can be enrolled into the clinical trial and start according to the study protocol, e.g. taking the medicine to be tested. After finishing the trial the participants receive another detailed medical check- up. Are Participants allowed to cancel or interrupt clinical trials? Clinical trials can be left at any time without further explanation. Participants do not have to fulfill any obligations. However, concerns and fears should be discussed with the treating doctor or scientist first. What about the participants’ safety? The declaration of Helsinki states that participants should not be exposed to any needless risks. In addition to that every participance should be based on a free informed consent and optional choice. The risk-benefit balance is of great importance and should be discussed among other topics with the participants before starting the clinical trial. Risks should be kept as low as possible. Moreover, it is crucial to follow the study protocol, which was developed and approved by an ethics committee. Medical doctors need to have specific qualifications in order to conduct a clinical trial. The clinical trial must be approved by the government (Bundesinstitut für Arzneimittel- und Medizinprodukte/ German Federal Institute for Drugs and Medical Devices). During the trial, participants receive constant check-ups and specific monitoring, which helps following the given study protocol, the good clinical practice and fulfilling international rules and current guidelines. Specific health insurances will cover any damages the participant might suffer from. Personal data are kept secret as stated in the current data protection and privacy guidelines. They will be pseudonymized according to the Medical Products Act (Arzneimittelgesetzt) to deny unauthorised access and usage. All kind of data are protected by law and can only be revealed by court under given circumstances. Do participants have to bear any costs? In general all clinical studies are free of charge. Representation allowances will cover any expenses the participant might has to pay.